Presenting, Super Aurum - an address that is an oasis of calm, peace and magnificence in the hustle-bustle of the city, Hyderabad. Your home will now serve as a perfect getaway after a tiring day at work, as Super Aurum ambiance will make you forget that you are in the heart of the city, Banjara Hills. Super Aurum is a large project spread over an area of 0.11 acres. 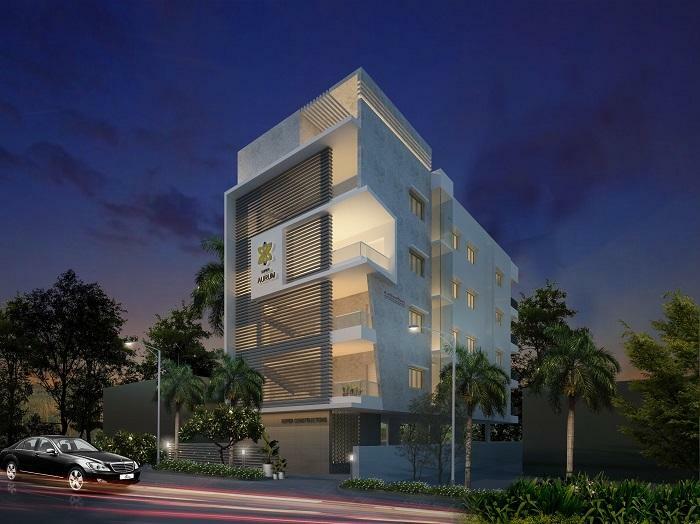 Super Aurum comprises of 4 BHK Apartments in Hyderabad. Super Aurum brings a lifestyle that befits Royalty with the batch of magnificent Apartments at Banjara Hills. These Residential Apartments in Hyderabad offers limited edition luxury boutique houses that amazingly escapes the noise of the city center. Super Aurum is built by a renowned name in construction business, Super Constructions at Banjara Hills, Hyderabad. The floor plan of Super Aurum presents the most exciting and dynamic floor plans designed for a lavish lifestyle with 4 floors. The master plan of Super Aurum offers people a strong connection to their surroundings, promoting a sense of community whilst balancing this with a distinct private address for individual homeowners. Amenities: Out of the many world class facilities, the major amenities in Super Aurum includes Landscaped Garden, Swimming Pool, Gymnasium, Play Area, Intercom, Lift, 24Hr Backup Electricity, Multi-purpose Hall, Terrace Garden and Security. Location Advantage: There are number of benefits of living in Apartments with a good locality. The location of Super Aurum makes sure that the home-seekers are choosing the right Apartments for themselves. It is one of the most prestigious address of Hyderabad with many facilities and utilities nearby Banjara Hills. Address: The complete address of Super Aurum is Plot no.67, Rd Number 12, Banjara Hills, Hyderabad, Telangana, INDIA..
Banjara Hills, Hyderabad, Andhra Pradesh, INDIA. SUPER CONSTRUCTION CO. (SCC) is one of Indias leading property development companies with over three decades of experience in offering solutions to individuals and corporate customers. Our projects offer lifestyle propositions to home buyers and world class office space for corporate users. With key focus on client requirements, the group has a bouquet of projects acrossNavi Mumbai and Mumbai Metropolitan Region. At SCC, delivering projects of superior quality, on budget and on time, maintaining high standards in customer relationship management, have been the metrics of its performance. Over the last decade, the contribution to Residential and Mixed-Use Real Estate inNavi Mumbai and Mumbai is quantified by 30 million sq. ft of completed d evelopments, while a substantial development is already in process. SUPER CONSTRUCTIONS is an GOOD builder. It has 5 on-going projects with total inventory value of Rs.197 Cr and 2 completed Projects. First class light-weight red bricks masonry in cement mortar . Outer walls are of 9" & inner walls are of 4 " thickness. UPVC windows Fenesta / Kommerling or equivalent make with glass panels fitted with elegantly designed M.S. painted grills and standard hardware. Imported marble flooring in hall and living room and 1m x 1m in bedrooms of Nitco Tiles or equivalent make. Wooden Flooring for Home theater room. Dadoing in kitchen: Glazed ceramic tiles dado upto 2' heightabove the kitchen platform. Granite platform with built in Stainless Steel sink with adequate power points and provision for exhaust fan and chimney. Provision for washing machine and wet area for washing utensils etc. Hot and cold single lever divertor with shower of Kohler/Grohe or equivalent make. Telephone Point in Living Room and Master bed room. Automatic Lift of 6 Passenger capacity of SCHINDLER / FUJITEC or equivalent make. Review of Super Aurum, Banjara Hills? Its price, location, builder etc. Review of Super Constructions, Banjara Hills? construction quality, trustworthy, delivery history etc.? Review of Super Aurum, Banjara Hills location? neighbourhood, connectivity, schools etc.? Comparison of Super Aurum, Banjara Hills to nearby projects? Is it rightly priced? What is your feedback on this Super Aurum, Banjara Hills? Depends on brand name and complete the project in time etc? Will this be a better option for investment or to live in Super Aurum, Banjara Hills? Can you give some suggestion? Is the Super Aurum, Banjara Hills has more potential in terms of capital appreciation, ROI, Rentals, Proximity to social infrastructure etc?